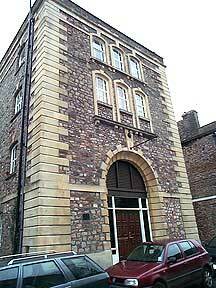 Cave Studio, St.Pauls, Bristol. This is where it all started in 1979. Two young men decided to build a studio. 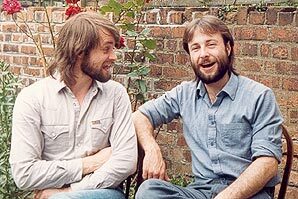 They were Bill Ferrier who had been working as a professional musician in the USA and Andy Allan who had been working in London as an engineer. 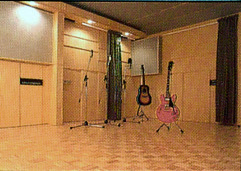 Cave was a Retro Studio... not because of any intention to be so, but because we had no money. The only equipment that we could afford was anything that was being thrown out or sold off cheap. Fortunately, Andy was able to repair most things, and as the studio came together we discovered how good all this old gear sounded. Our first desk was an ancient Sound Techniques dubbing console that was used on the Beatles film "Magical Mystery Tour" and needed a complete rebuild. 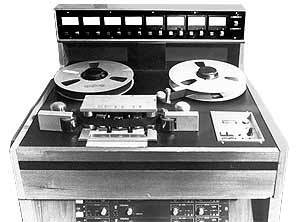 The tape recorder was an old one inch eight track made by Klark Technik and again, needed a complete rebuild. The Klark Technik 1 inch 8 track. Bill (with beard) and friend singing. 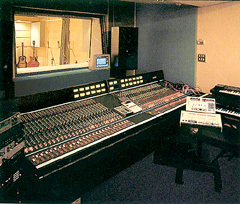 As time went by, the studio started to gain quite a reputation and sounded so different to the 80's SSL sound that prevailed. We stuck to our conviction and continued down the retro route adding more old gear as it became available. 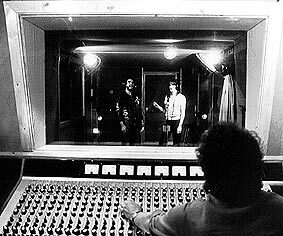 The studio was upgraded to 24 track in 1983 with a "new" old Helios desk formally owned by The Who, and was again, totally rebuilt by Andy. Andy with the 3M's M79 24 track. We scraped up a staggering £12,000 for it back then! You'd only pay £100's for them now! Andy and Gerry O'Riordan who joined us in 1983.
and is a highly respected engineer. 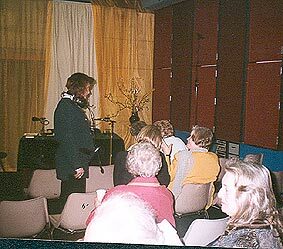 The Cave was a very busy studio right up to the end in 1985 when it was forced to close due to a planning dispute. 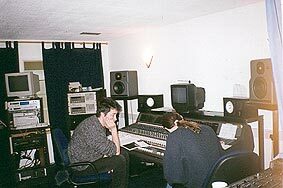 Andy decided to re-open a new studio which became the Coach House Studios in 1989. All of the old and interesting gear that we had at the Cave came to the new studio along with a very extensive stock of old microphones and valve outboard. The old Helios was sold to Tony Larking. Does anyone out there know where it is now? 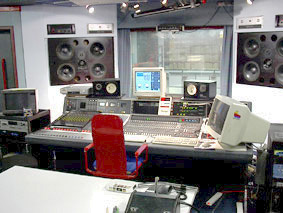 Likewise the old Sound Techniques desk which was sold to a buyer from Wiltshire. Is it still out there? We would love to know! During the Cave days we also operated a small record label called "Caveman Records". This enabled unsigned bands to put out vinyl singles instead of cassettes. They acted as an upmarket demo and gave the bands a product they could sell at gigs and in local record shops. Keep a lookout for any old Caveman Records pressings. They are now changing hands amongst collectors for £60 each! If only we had known! And is it any wonder that today's musicians now value so highly the old gear that was being junked back in 1979? Some of the old Cave masters demos are to this day are still in manufacture as they captured a musical era whose sound is yet to be bettered! We became quite fond of Rocky, but he was killed off because he was deemed too sexist! And then it was the end. The studio had to go and so did the beards! Well, as it turned out, Bill still has his beard. And the story was only just beginning! Coach House Studios, Clifton, Bristol. Made famous by the debut albums of Massive Attack and Portishead. Designed and built by Andy Allan, Engineer and Director. 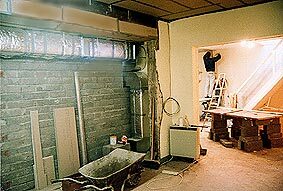 After a break of two years following the closure of Cave Studio, the time taken to find the right premises, work started in 1989. 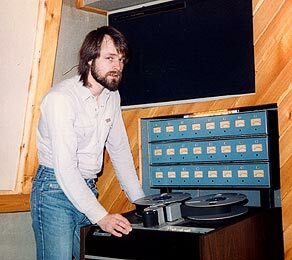 The aim was to create not a state-of-the-art digital/analogue studio, but one which recaptured many forgotten and time-honoured recording technologies. The two air conditioned main rooms were constructed in wood and finished in ash and oak. 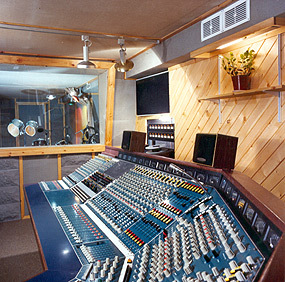 The Coach House Studios became the home of the Bristol Sound and enjoyed much acclaim both nationally and internationally. The time was right, and the Coach House was at the forefront of a new musical genre which inspired a generation. The Coach House included a unique moving ceiling variable acoustics system that could be MIDI controlled. 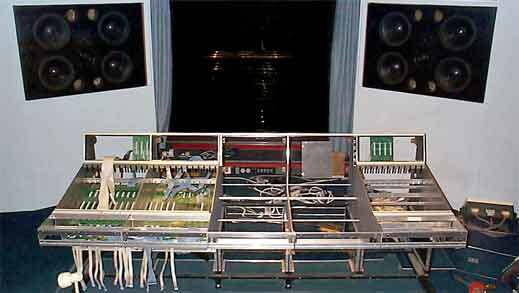 As far as we know, this was the world's first variable room acoustics that can be synchronised to a real performance. Each of the 12 panels had a reflective and an absorbent surface and could be flipped over silently by it's own 1 horse power direct drive DC servo. As the millennium drew to a close the ever increasing pace of technology started to take its toll. 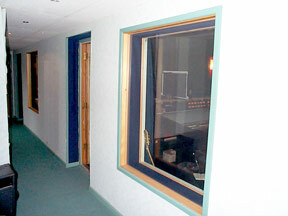 We decided that the Coach House could not continue as a commercial recording facility despite it's reputation. It was sold in 1999 to a local composer and now supports a number of smaller operations. Christchurch Studios Clifton, in Bristol. Our biggest project so far. 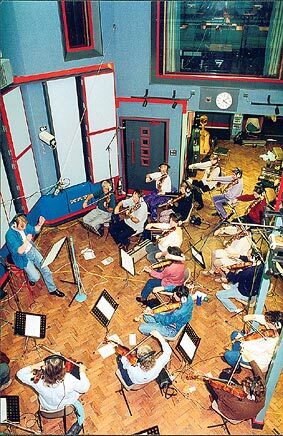 This amazing studio formerly owned by the BBC was bought by us in 1994. Over a period of four years we rebuilt and extended the facilities and established it as a centre of excellence unsurpassed by any other enterprise of its type in the area. 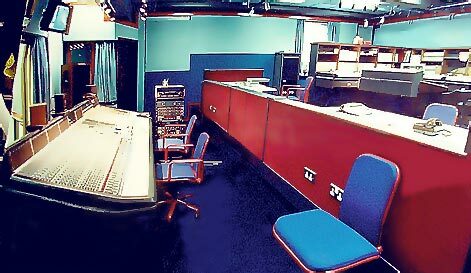 Shown Here: The studio and control room after the BBC refit in 1986.
of the Bristol Old Vic Theatre School. 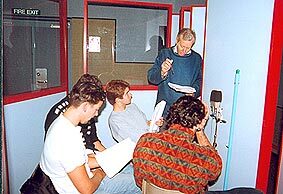 We maintained a special relationship with the school established by Shaun where students could receive radio drama training. This was to prove a vital link in the future development of Christchurch Studios! 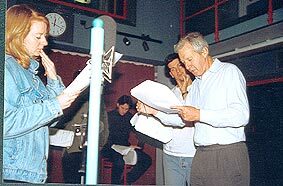 One of the many BBC Radio 4 programmes we recorded. Our in-house string section in session. 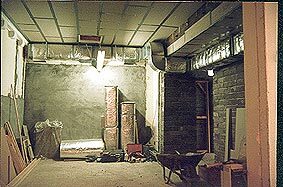 In a short time the studio was re-established, and with the addition of two more studio suites on the undeveloped second floor, work got under way on the second Massive Attack album. The BBC chose not to use these areas because of the difficulties in providing adequate sound insulation between the floors. We solved all of these problems by floating the entire suite of rooms on springs! Shown here: The floating rooms and corridor. Producer Neil Davidge and engineer Lee Shephard. The main Christchurch Control Room showing the Quested 4 by 10 main monitors and Neve installed by us. In 1998 the lease on Christchurch ran out and after a prolonged business strategy review we decided that the studio would be able to continue a sustained development if it were to be owned an run by a co-operative or an institution. With this conviction, we invited the Bristol Old Vic Theatre School, who were looking for further premises at the time, to take on the lease and acquire the studio infrastructure. How fortunate for all that those early links were kept alive. Thanks Shaun and John!